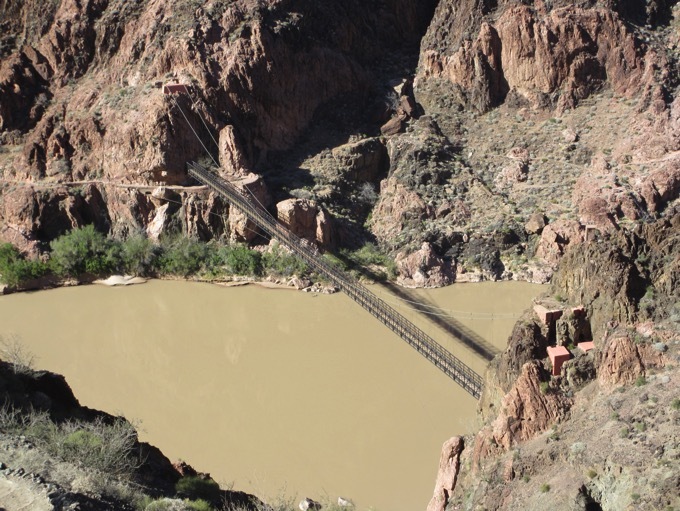 The suspension bridge from S. Kaibab Trail to Phantom Ranch in March. So, it may be stretching it a bit to call the South Rim of the Grand Canyon a winter fitness destination but it does work most years for a late winter/early spring venue. The South Rim is about 7,000', so freezing nights extend well into spring but dry air and brilliant blue skies make the days beckoning nonetheless. Even if it only warms into the 50's, it can be delightful. And what really makes it work for the fitness-focused are the trails going down into the Canyon. top. The temperature difference between the South Rim and the Ranch can easily be 20-30°. Amusingly, the perception of the temperature varies more with the direction you are going on the trails than the actual elevation or temperature because of the level of effort. Mid-March of 2014 we walked almost an hour from the RV park to the South Kaibab trailhead on the Rim. We started about 11 am under sunny skies and the temperature was still in the 30's with some wind. It was noticeably warmer at the trailhead, but not so warm that we shed any of our layers when we began heading down the South Kaibab trail. We were content to keep our warm clothes on for about 2 hours of our descent though we noticed that everyone heading up the trail was stripped down to T-shirts or tank tops. We shivered in the shade when the sharp winds hit and were a little too warm in the sheltered sunny spots but we didn't change into cooler clothes until more than half way down to the river. 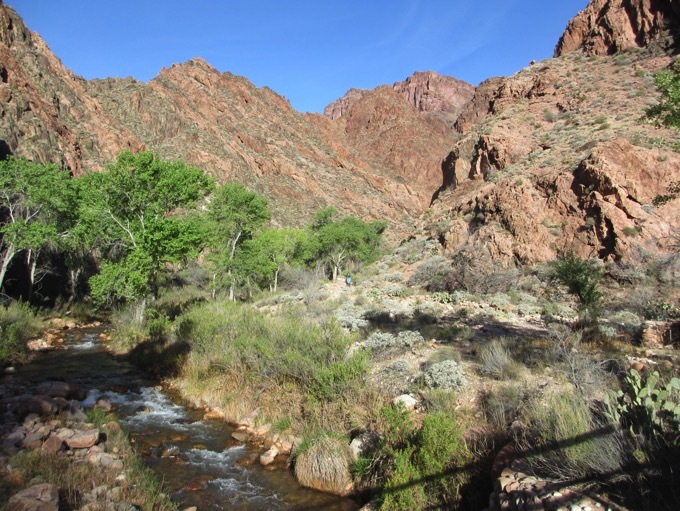 Phantom Ranch is situated at the lush bottom of Bright Angel Canyon. Two days later when we ascended via Bright Angel trail, the reverse was true. We left Phantom Ranch in summer-weight pants with heavy tops and gloves at 8 am. In less than an hour, we changed into our lightest clothing and were comfortable the entire hike up to the Rim, even though people descending were bundled up. Once at the Rim, it was cool enough in the wind and on flat terrain to long for our jackets but we didn't bother putting them on. Exertion made all the difference in the "comfort index" in March. Check the forecast before you head for the Grand Canyon in the winter to avoid a harsh spell and bring your layers so you can dress for both winter and summer on the same day. These 2 iconic trails, the South Kaibab and Bright Angel, are the big draws for athletes in the Grand Canyon but how people use them varies hugely. During our first visit to the Grand Canyon in 2012, we were content to walk a bit more than half way down both trails, each lunch, and return to the Rim. On Bright Angel, that takes one to the delightful Indian Garden oasis, which is a refreshing place to have your picnic. It is a favorite stopping point because of the shade of the cottonwoods, pit toilets, benches, and drinking water. On South Kaibab, it's the stunning panoramas with a great view of the Colorado River that gives one the satisfaction of arriving at a destination when only part way to the river. Toilets but no water, little shade, and steeper grades make the South Kaibab a less popular route. But on both, our selected turn-around points resulted in about 9 mile round trip hikes with over 3,000' in elevation gain. Sampling the trail to the North Rim. This year, we kept the mileage about the same as our 2012 day trips by hiking to Phantom Ranch via the South Kaibab trail from the RV park, spending 2 nights at the Ranch, and then walking back up to the Rim on the Bright Angel trail. This itinerary is more demanding than our day hikes because one day is all descending and the other is all ascending. Ours was the classic loop, apparently because the Kaibab trail is shorter, but we made a loop for the varied scenery (and spent an hour walking to the trailhead). The views from the South Kaibab trail are much more dramatic than Bright Angel but the trail itself is harder. More of the trail surface on the South Kaibab is like stepping on ball bearings than on Bright Angel and it is much steeper. One blogger declared it a victory when she only lost 3 toe nails going down Kaibab. Bright Angel is the trail of choice for many because there is water available on it, which is a huge plus. In March, only Indian Garden had drinking water but in another month there would be water at 3 more locations on Bright Angel. Since we managed to book a second night at Phantom Ranch once there, we made a 10 mile RT hike towards the North Rim on our layover day, which kept up the physical intensity of the trip. We only carried day packs and paid for "duffel service" to have 30 lbs of food and a few personal items hauled down to Phantom Ranch by mule. We'd eaten most of the food but had our rodent-proof packaging and cold weather clothing hauled back up to the South Rim as well. The only way to make the trip down to the Colorado River easier than we did is to ride a mule down, which adds a new adventure but eliminates the fitness element. Others amp-up the difficulty by hauling all of their camping gear down and up on their backs, which is very demanding on either trail (lots of 'high stepping' over barriers). Those who are much more fit than us make the round trip from the South Rim to Phantom Ranch and back to the Rim in one day. Depending upon how it is done, that's around 20 miles and 4,700-5,000' elevation gain. Some use the same trail for the round trip, others make a loop by connecting the 2 trails, which adds more miles. The Park Service all but forbids doing this in one day because they have had to rescue so many people (mostly young men) each year who overextend themselves attempting it. 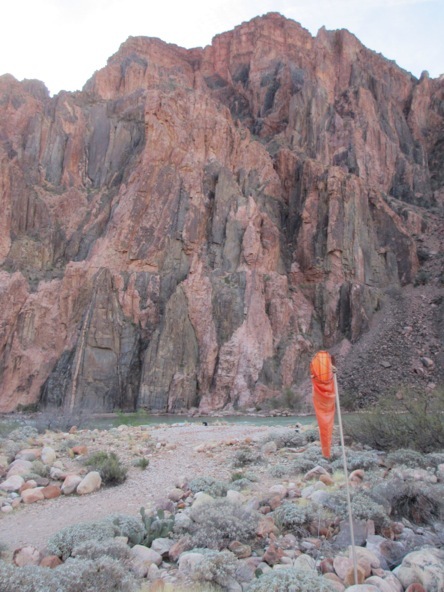 The Phantom Ranch heliport is next to the Colorado River. The super-fit run or hike "Rim to Rim" (R2R) which is going from the South Rim of the Canyon, down to Phantom Ranch and up Bright Angel Canyon on the North Kaibab trail on the other side of the river to the top of the North Rim. That's a total of 24 miles one way. And some do "Rim to Rim to Rim" (R2R2R) as in going to the North Rim by starting and finishing on the South Rim. I spoke with a 50-ish hiker resting around breakfast time at Phantom Ranch who was doing "Rim to Rim to Rim" and he was mighty unhappy. He had started down from the South Rim at 4 am the day before, had gone up to the North Rim, camped and slept for about 3 hours somewhere on the way back, and was resting at Phantom Ranch 28 hours after his departure. He was slumped in a chair in the Canteen and was shoveling in packets of junk food and commented that he was "cold and tired and actually looking forward to hiking 10 miles up to the South Rim because the descents had been so punishing." There are other trails and other options in the Grand Canyon that are favored by the backpackers but Kaibab and Bright Angel are the clear favorites for the CV/fitness crowd. 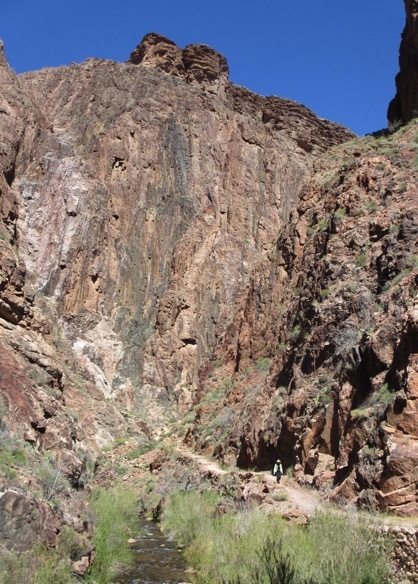 These trails offer significant distances, significant elevation gain, unusually high elevation (7,000' on the South Rim; 8,200' on the North Rim), challenging trail conditions, and stunning scenery. That's why we came back and that's why we'll be back again. The Grand Canyon National Park is a well-equipped destination. There are hotels, motels, and rustic cabins as well as an RV park with hook-ups and standard campgrounds. The Market and General Store have unusually broad and deep product lines for food and camping gear. And there is a small medical clinic in the park as well. Flagstaff is the nearest city, which is about 90 minutes away. Better prices and more variety are available for your shopping needs at a Walmart SuperCenter, a large health food store, Peace Surplus (outdoor gear), and an REI that opened in 2014. Check-out "In More Detail / Phantom Ranch" for more specifics on lodging and supplies at Phantom Ranch.